Ford GoBike, the Bay Area’s new bike-sharing system, provides a network of bicycles available on demand for one-way trips — no locks and no reservations required. A total of 1,500 Ford GoBikes are planned for Oakland, Emeryville and Berkeley, 4,500 for San Francisco and 1,000 for San Jose. Some 546 bike-sharing stations — where riders drop off and pick up the bikes — will span the five cities by 2018. Compare this to Bay Area Bike Share, the region’s previous iteration of the program, which consisted of just 700 bikes split between San Francisco and several cities on the Peninsula. Of course, numbers alone aren’t enough to guarantee the program’s success. At its planned scale, Ford GoBike has the potential to become a new transportation system for the region that will change how people can move around cities — but only if there are policies and programs in place to help guarantee its success. SPUR has identified five ways Bay Area cities, including those without Ford GoBikes, can get the most out of bike sharing. The Bay Area now has an extensive bike-sharing system, but that doesn’t change one of the fundamental truths about biking: People only ride when they feel safe. Many who are on the fence about biking — transportation planners called them the “interested but concerned” — view bicycling positively but don’t currently ride due to concerns about safety and comfort. Bike sharing, with its ubiquity and ease of access, could introduce this group to biking as a means of transportation, as well as to the joys of biking. But to succeed, Ford GoBike should be matched with extensive networks of protected bike lanes. Research from the National Association of City Transportation Officials (NACTO) found that pairing bike sharing with protected bike lanes encourages riding: In seven U.S. cities, people using bike sharing make up a disproportionate number of the riders on protected lanes, and stations adjacent to bike lanes are busier than ones that are not. The quality (or even existence) of bike networks varies significantly in the Bay Area. San Francisco is slowly building a protected bicycle network, and Berkeley recently passed a visionary bike plan that will build a network of safe, connected bikeways throughout the city. Oakland’s Department of Transportation is in the process of updating its bicycle plan and San Jose is working to implement protected bicycling infrastructure throughout its network, hoping to grow the share of trips taken by bike from 1 percent to 5 percent of all trips by 2020. While these efforts are critical, the vast majority of these improvements won’t actually be in the ground until long after the bike-sharing stations are up and running. What’s more, the gaps in the bike network that are most likely to discourage “interested but concerned” riders may be the most difficult and expensive for a city to fix. As the Ford GoBike roll out continues, cities should embrace temporary and “pilot” projects as opportunities to close key gaps in their bike networks today as they continue working on more permanent long-term solutions in the years to come. A public bike-sharing system should serve all types of residents. Studies have found that bike share members are more likely to be white, affluent, well-educated and male, and members of the previous Bay Area Bike Share system fit this mold: 70 percent were male, 87 percent had a college degree or higher and 75 percent were white. With Ford GoBike, the Bay Area has the opportunity to buck this trend and prioritize inclusivity. Ford GoBike is a private-public partnership between Motivate, North America’s largest bike-sharing operator, and the Metropolitan Transportation Commission (MTC), the region’s transportation planning, financing and coordinating agency. Motivate and MTC have taken several steps to ensure that the system is available to a range of users. An annual membership costs $149, but Motivate’s Bike Share for All program offers a discounted annual membership of $5 for the first year and $5 per month in the year thereafter to people with low incomes. 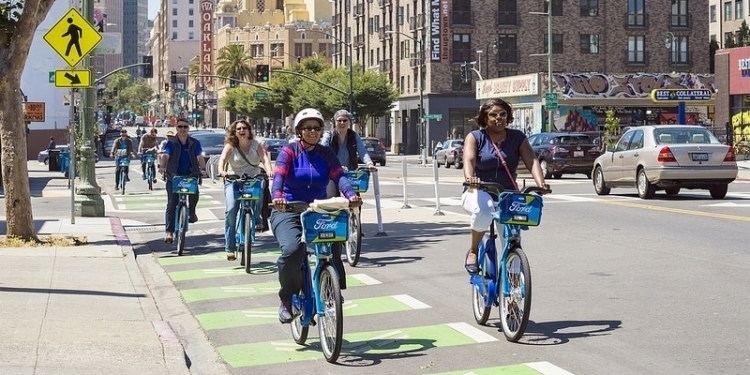 Motivate also committed to placing at least 20 percent of bike-sharing stations in Communities of Concern, areas with concentrations of low-income and minority populations, in addition to other factors. So far, the program has exceeded this goal: 35 percent of bike-sharing station are currently in Communities of Concerns. MTC and Motivate provided funding for extensive community outreach in low-income communities to get the word out about bike sharing and how to use it, as well as to gather information about barriers to using the system. One way bike sharing can be out of reach for people with low incomes is that systems typically put a hold on users’ credit cards as a hedge against potential loss or theft. Holds are problematic as they can lead to a credit card being frozen or maxed out; many users, in particular lower-income users, shy away from bike sharing for this reason. Motivate has chosen not to place holds on users’ credit cards and in doing so removes a significant barrier to bike share usage. The advocacy group TransForm conducted surveys at bike-sharing outreach events in East and West Oakland. Cost was identified as the biggest barrier to participation in shared mobility programs. TransForm recommends the City of Oakland set aside a portion of permit fees collected from shared mobility companies to fund equity programs. Source: TransForm, OakMob 101: A Case Study in Expanding Access to Shared Mobility, 2017. While it’s laudable that Motivate, a private company, is demonstrating a commitment to equity, bike sharing must present a good value proposition for low-income residents for it to actually be used. A steep discount doesn't necessarily achieve this goal given larger cultural and institutional barriers that will require greater action from MTC, the five cities, and others. Some communities are already expressing their concern. It is imperative to ask communities how bike sharing could fit into their transportation needs, and if so, under what conditions. When it comes to encouraging bike share use among lower-income communities of color, researchers from Portland State University identified five main barriers to uptake: 1. information about how to use bike sharing and about discount programs; 2. access to protective gear, like helmets; 3. reassurance about liability and hidden fees; 4. harassment (including by law enforcement) and 5. access to safe places to bike. Motivate, MTC and the five cities are poised to solve the first three concerns, which point to a need for intensive and ongoing outreach and education with the community as an active partner. The best way to get the word out about bike sharing, the researchers found, is face-to-face in-person communication. Station kiosks, radio and television ads, and other passive forms of outreach don’t translate as successfully to bike share use in low-income communities and communities of color. Boston is the only city with a bike-sharing system where subsidized members make up a significant portion (18 percent) of the overall ridership, a success that can be attributed to the extensive resources the city has put into nurturing the program, including employing a staff member who spends 30 percent of their time expanding the subsidized membership program. Crucially, TransForm, Cycle of Changes, Scraper Bike Team, the San Francisco Bicycle Coalition, SF Yellow Bike and Bike East Bay are acting as ambassador partners to Ford GoBike until mid 2018, with funding provided by MTC. But as Boston demonstrates, the commitment needs to be ongoing and, ideally, institutionalized. The final two issues, notably traffic safety, which is consistently cited as a major impediment to riding across all racial and income categories, will require greater time and investment from the cities and MTC. As noted, cities need to continue building better bicycling infrastructure and commit to eliminating bicycle injuries and deaths from their streets. Ultimately, an emphasis on equity means installing stations in areas that don’t necessarily score well on traditional measures of feasibility, such as a high density of residents or destinations like transit stops, job centers and retail stores. The National Association of City Transportation Officials recommends ensuring that all neighborhoods in the program areas are served by a large number of bike-sharing stations evenly spaced a short walking distance apart — regardless of each area’s population or number of destinations. As criteria for station placement, TransForm suggests prioritizing zip codes where people rely heavily on transit and communities that experience high levels of air pollution and other environmental hazards. Motivate and Ford are covering many of the costs associated with the installation and operation of Ford GoBike. But to ensure that the program is accessible and affordable — and that the ridership reflects the diversity of the region, including people with disabilities — the five cities and MTC need to be prepared to subsidize the program at some point. TransForm's report on mobility in Oakland and research from NACTO and several universities provide excellent direction on how to achieve an equitable bike-sharing system; MTC, Motivate and the cities should seek guidance from these reports to ensure the region’s new bike-sharing system truly works for all. One of the more exciting things about Ford GoBike is that riders can access or “check out” a bike from a docking station using a Clipper card. But there’s a catch: This benefit is only available to those users who have purchased a Ford GoBike annual membership. People can’t use the cash they have stored on their Clipper card to purchase a single ride or a day pass. Adding this feature would make the partnership between Clipper and Ford GoBike truly exciting — and groundbreaking — but it’s not available because the Ford GoBike account is linked, and not actually integrated, with a Clipper account. While Ford GoBike does have an app, it doesn’t match the convenience and ease of paying with a Clipper card — which is why Motivate opted to make Ford GoBike available via Clipper in the first place. While current Clipper technology does not support integrated products, the region is in the process of updating the fare payment system. Allowing for integrated payment should be a key feature of Clipper 2.0. Ford GoBike is a unique partnership between a public agency and a private company. MTC negotiated with Motivate on behalf of and in partnership with the five cities served by the expanded service, allowing for a single bike-sharing system with uniform pricing. The partnership represents a rare moment of cooperation where cities negotiated together to secure the best collective offer on behalf of their residents, workers and visitors. Motivate went on to secure Ford as the title sponsor for a seven-year period, allowing Motivate to finance the huge capital outlay required to order, assemble and deploy the bikes and stations up front. Cities not currently part of the partnership can buy in to the program. (MTC is in the process of reviewing applications to fund other systems through its Bike Share Capital Program, and these jurisdictions can choose any operator or type of system, including Motivate.) Motivate will operate Ford GoBike in a new Bay Area city at zero cost, provided a certain level of usage can be achieved. The bike-sharing industry has matured and diversified, and numerous “dockless” bike-sharing programs are emerging. These systems don’t require docking stations; bikes can be left just about anywhere, and riders use an app to both locate and lock them. The City of San Mateo is currently operating an independent bike-sharing system called Bay Bikes, San Francisco now hosts two dockless bike-sharing systems, Blue GoGo and Jump Mobility, and two more, Spin and LimeBike, recently launched in South San Francisco. San Francisco recently enacted a permit program to better manage and regulate dockless bike-sharing systems. New York City's bike share program, which is also run by Motivate, is exploring how dockless bikes could be integrated in their existing, more conventional system. There is now a lot more room to grow and explore in the bike-sharing industry than there has been previously. While this is exciting, its remains key that all new expansions and forays be done strategically so as to enhance, and not undermine, the original goals of the program. A city’s goals, the cost of the system, the type of land use (rural, suburban or urban) and the population density, among other factors, will ultimately drive what type of system is right for a Bay Area city interested in bike sharing. But the proliferation of options across the region does have the potential to result in a fragmented landscape. The Bay Area should heed the successes and failures of the fragmented bike-sharing systems in the greater Los Angeles area. LA Metro runs one multi-city bike-sharing system that serves downtown Los Angeles, Pasadena and (soon) San Pedro. The cities of West Hollywood and Beverly Hills jointly run another system. Santa Monica also has its own system, as does the City of Long Beach. What ties all these systems together is the TAP card, the Los Angeles version of the Clipper card. But because bike-sharing memberships are linked to the TAP card instead of being integrated (much like Clipper with Ford GoBikes), people need multiple memberships linked to a single TAP card to use bike sharing across the Los Angeles area. While not a perfect solution, this does limit the inefficiencies that can result from fragmentation. One idea for the Bay Area is a cost-sharing arrangement that allow people with a subscription to one system to have access to all, accessible through their Clipper card. Other bikeshare systems run by Motivate across the country have regularly provided anonymized data of their users’ ridership trends for use by the public at large. They have even hosted Data Visualization Challenges to see what interesting things people can do with the data supplied. While it’s fun for those with the skills to do interesting things with data, this energy should be channeled productively to help assure the success of bike sharing, and bicycling in general, in the Bay Area. Agencies should open dialogues with Motivate, and each other, on the best way to collaboratively use the data generated. For example, data could be used to guide investments in the bike network, explain the benefits of bike sharing to neighborhoods or business districts and generally raise the profile of bike sharing. In many cities, bike sharing has become an integral part of the transportation network: Over 28 million bike-sharing trips were taken in the United States in 2016, a 25 percent increase over the prior year. New York City’s Citi Bike served more than 14 million trips in 2016 alone, and Divvy, Chicago’s bike share system, recorded more than 3.5 million trips in 2016, a 14 percent increase over the previous year. Ford GoBike can connect people to places faster, reduce the need for cars, decrease the cost of transportation and improve health. With the right policies and programs in place, the Bay Area should get these benefits and more from this opportunity.